Where better than from the observation deck of the Empire State Building can one get an appreciation of the geology and geography of the New York City area? Well, whatever it will cost you a lot more than the $4.50 admission fee to this marvelous attraction! View of the Empire State Building taken from the 40th floor of the Grace Building on 42nd Street. 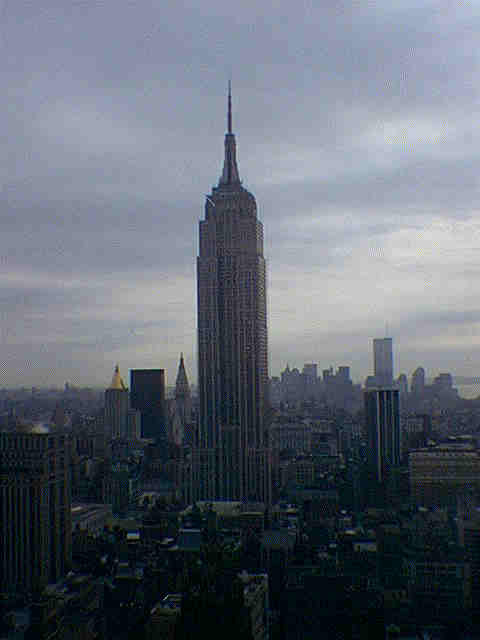 The Empire State Building, situated in midtown Manhattan at 5th Avenue between West 33rd and West 34th Streets. The Empire State Building is one of the world's tallest buildings (rising to 1,472 feet high at the top of its radio tower; it was originally at 1,250 at the top mooring mast for dirigibles). The foundation is on solid bedrock 55 feet below street level. The public 86th floor observation deck is at an elevation of 1,050 feet. On a very clear day visibility can range 40-50 miles! The building is a testament of the will power of determined individuals. The building was designed in the 1920s and constructed in two years in the beginning of Great Depression; it was completed in 1931, taking approximately 18 months to construct. The roughly 2 acres of land cost $16,000,000 and the construction cost ran roughly $25,000,000 - a reflection of reduced costs for skilled labor during the time. View EAST from 86th Floor. View NORTH from the 86th Floor. View WEST from the 86th Floor. View SOUTH from the 86th Floor. Expect windy and cold temperatures! Lightning strikes the top of the building frequently during storms. Why is this attached to the Geology and Geography of the New York Home Page? What would this view look like 100; 200; 500; 10,000; 100,000; 1,000,000; 10,000,000; 100,000,000; and 1,000,000,000 years ago? How will it appear in the near and distant future? Where did all that building material come from? Where will it all go in the future? What means are necessary to maintain this city into the near and distant future? 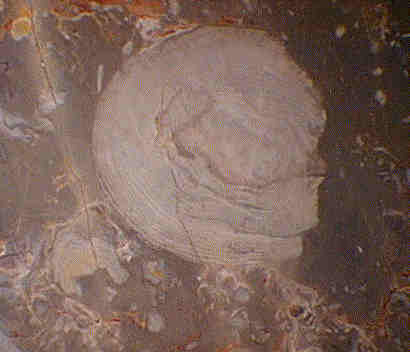 The facade of the building consists of Indiana gray-tan "oolitic limestone" that was deposited in the bottom of an inland sea nearly 300,000,000 years ago. 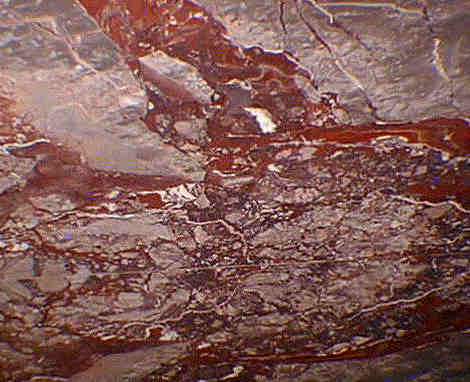 Brecciated marble with terra rosa (iron mineral). A beautiful map of the New York region constructed of stone and metal is the highlight of the lobby! Plan to spend a couple hours on this tour! Groups are advised to call ahead: (212)736-3100. The Observation Deck is open 9:30 am until midnight.